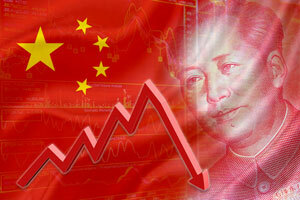 Will China Lower Interest Rates? Subject: Will China Lower Interest Rates? × 2 = 14 Required Please enter the correct value. With the Shanghai Composite tumbling 16% this week alone and rattling global markets, readers are asking us, "Will China lower interest rates?" The simple answer is that they already have. The Shanghai Composite finished in the red today (Wednesday) for the fifth consecutive day. The index was up as much as 4% at one point, but finished the session down 1.3% to 2,927.29. The benchmark fell below 3,000 for the first time in eight months on Tuesday to close at 2,964.97. In the five days since Aug. 19, the index is down 23.3%. In an attempt to calm markets, China's central bank cut its key lending rate by 0.25% to 4.6% Tuesday after the close. The People's Bank of China (PBOC) also reduced banks' minimum reserve requirement by 0.5%, effective Sept. 6. The move will add roughly 678 billion yuan (about $105.7 billion) into the Chinese economy. "The main goal of cutting rates is to support the healthy development of the real economy," the bank said in a statement. A rate cut makes it cheaper for banks to borrow from the central bank. In turn, that will make it easier for businesses and private people to borrow money from those banks. However, easy credit is partly to blame for the recent rout in China's stock market. You see, shares in China soared a meteoric 150% from June 2014 to June 2015. The run was fueled by individual investors who often borrowed heavily to start investing. In a new easing effort announced Wednesday, the PBOC said it would inject $21.8 billion into the financial system. Even amid Wednesday's new fiscal move, investors continue to ask, "Will China cut interest rates even further?" The PBOC has cut rates five times since November, and some economists expect additional moves by the Chinese government. Tags: China interest rates, China's central bank, china's stock market, China's stock market crash, chinese economy, Chinese equities, Chinese stock market crash, Chinese stock markets, PCOB, stock market crash, Will China Lower Interest Rates?